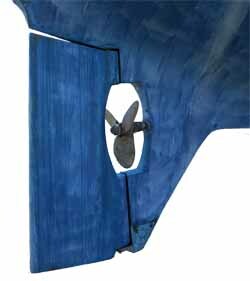 Which type of Sailboat Propeller is Best for Your Cruising Requirements? Which Type of Sailboat Propeller is Right for Your Boat? What we'd really like is a sailboat propeller that's 100% efficient under power with zero drag under sail. Of course that's never going to be possible, but we can get some way towards it. It would be nice to think we sailors only use our engines for getting in and out of harbour and topping up the batteries. But when the wind is being uncooperative - not enough of it, or blowing from where we want to go - then many cruisers will drop the headsail and motor-sail towards their destination. The point at which we do so is a personal decision. Some of us only resort to it after the spinnaker has collapsed lifeless and deflated onto the foredeck, whilst others cheerfully turn on the donk if they can't fetch their destination on one tack, or get ashore before the bars close. Skippers of older yachts with single cylinder long-stroke thumpers may be more reluctant to do so than those with modern high-revving but quieter, vibration-free installations - but sooner or later even they will be reaching for the ignition keys. 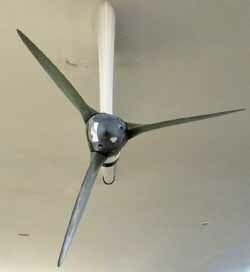 And having made the decision to motor you might as well get a move on, and a fixed three-bladed propeller is the one to have for performance under power. Ah, but what about the drag it creates when under sail? Good point, the drag created by a fixed three-bladed prop is akin to towing a bucket, although the drag of a fixed twin-bladed prop can be reduced somewhat by lining it up vertically so that it's in the disturbed water aft of the keel. Under sail, and with the engine off, it's best to put the engine in gear as a non-turning propeller will create less drag than one which is spinning freely. If you're at all interested in performance under sail, there's little option but to spring for either a folding or a feathering sailboat propeller. Unless that is, you have opted for a shaft driven generator to top up the batteries; if so a folding or feathering prop isn't an option. In light airs one of these low-drag props can offer a dramatic increase in speed under sail, typically around half to a full knot - maybe 1.5 knots in light airs. They're not cheap, but usually represent the best performance gain per dollar when considered against other possible speed-seeking expenditure on rig or sail modifications. A 2 bladed folding prop is shown here on a saildrive unit, but 3 bladed versions are also available. On both types, the blades are pivoted and fold backwards under the force of the water flow when not being driven by the engine. It's often necessary to put the engine in gear to stop the shaft from turning which will get the blades to close. Pitch of the blades is fixed. 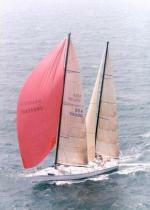 An internal mechanism turns the blade's edge into the water flow to minimize drag when under sail, as shown here. As engine power is applied the blades are turned into the required position for forward or reverse propulsion. Most feathering propellers have a pitch adjustment mechanism that allows adjustment of the propeller to the optimum pitch for the vessel. 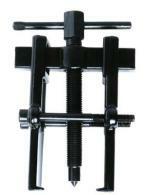 Some feature external pitch adjusters, which give simple access to the adjustment for forward and reverse independently. Forward can be set for optimum motoring performance and reverse can be set for best maneuverability and thrust - handy when trying to back off a sandbank, or bringing the boat to a rapid stop. More likely to foul ropes or nets when feathered. Long-keel boats and some fin and skeg arrangements (like the one shown here) where the propeller is located in an aperture are unlikely to have room for a folding prop; a fixed or feathering propeller is the only option in this situation. And whichever type of sailboat propeller you choose, a rope cutter fitted just forward of it may well turn out to be a wise investment.